At this point, Hollywood has remade A Star is Born so many times that its plot may seem a bit trite and overly familiar. Even Michel Hazavicius' much balleyhooed (and current Oscar) The Artist borrows heavily from its classic rags to riches story. Remade by George Cukor in 1954 with Judy Garland and James Mason, and again in 1976 by Frank Pierson with Barbra Streisand and Kris Kristofferson, with another remake on the way directed by Clint Eastwood and starring Beyonce, A Star is Born remains one of our most popular and enduring stories. Why? Because it taps into that innate appeal of Hollywood, that anyone, even a farmer's daughter like Esther Blodgett (Janet Gaynor) can make it big in Tinseltown. It is in many ways the quintessential Hollywood fantasy, the ultimate representation of what Hollywood represents (or once represented, or thought it represented). 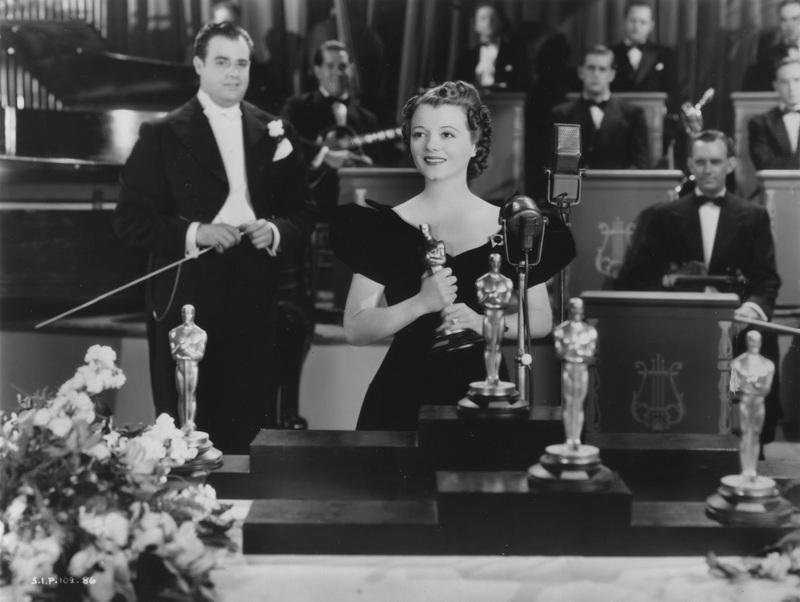 Janet Gaynor as Esther Blodgett/Vicki Lester and Fredric March as Norman Maine in A STAR IS BORN. Everyone has told Esther to give up on her dream. Her Aunt Mattie (The Wizard of Oz's own Auntie Em, Clara Blandick) thinks she spends too much time at the movies, a frivolous pursuit she has no use for. She wants Esther to get her head out of the clouds and pursue something outside of the glow of the silver screen. But Esther's grandmother, Lettie, encourages her to pursue her dreams, and loans her the money to get to Hollywood. So Esther strikes out on her own, staying at a hotel for $6 a week while trying to pick up extra work at a nearby studio. After being informed that her chances of making it in the movies is 1 in 100,000, she nearly gives up hope. But a struggling director staying in the same hotel gets her a job as a waitress at a swanky Hollywood soiree. It is there where she meets Norman Maine (Frederic March), one of the biggest movie stars in the world. He is instantly taken with Esther, and talks his producer into giving her a screen test. When the lead of Maine's latest film suddenly drops out, the studio turns to Esther to take her place, resulting in an instant hit. Esther is suddenly the talk of the town, but Norman's dependence on alcohol and a very public scandal have hurt his image. As Esther, newly renamed Vicki Lester, is on the way up, Norman is on his way down. And even after they get married, Vicki's newfound success may lead Norman down a very dark path of self destruction. Janet Gaynor as Esther Blodgett/Vicki Lester in A STAR IS BORN. What makes A Star is Born so remarkable is that inasmuch as it is a celebration of Hollywood and the starry eyed dreams that it represents, it's also an extraordinarily honest look at the fickle nature of fame. William Wellman's direction is serviceable but hardly groundbreaking, but the is nevertheless top shelf Hollywood studio product from producer David O. Selznick. Much like Sunset Boulevard, A Star is Born is a rare piece of Hollywood self reflexivity that portrays the industry warts and all. Wellman pulls no punches in his depiction of self-destruction in the face of declining fame, even in light of the birth of a new star, who could very well follow in his footsteps when her own fame begins to wane. Presentation-wise, it's hard to ask for more than what Kino has given us with this new blu-ray. The Oscar winning Technicolor cinematography is probably not as vibrant as it once was, and there are still imperfections on the source print, but given the film's age and the condition of the original negative it actually looks pretty good, especially with all the substandard copies floating around out there. The extras are scant, but a sole wardrobe test may have some value to film historians. 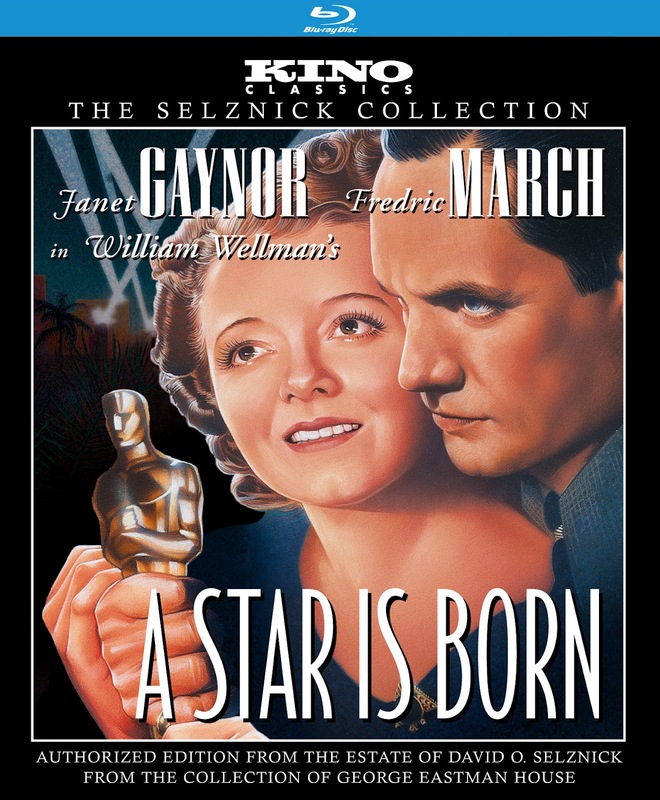 A Star is Born is a classic Hollywood tale whose influence and timeless themes continue to resonate today. For those only familiar with the Judy Garland version, this 1937 version will be something of a revelation. This is Golden Age studio filmmaking at its best. 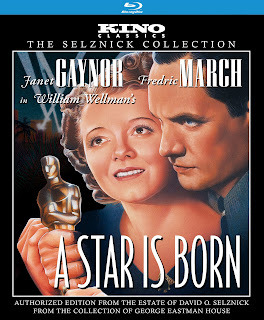 A STAR IS BORN | Directed by William Wellman | Stars Janet Gaynor, Frederic March, Adolpe Menju, May Robson, Andy Devine | Not rated | Now available on Blu-ray and DVD from Kino Lorber.